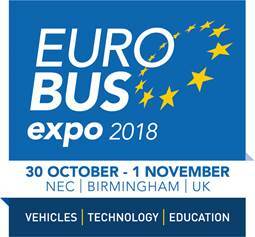 Promising ‘something for everyone’, Euro Bus Expo – the biennial event for the bus and coach industry in 2018, returns to the NEC Birmingham next week. The three-day event (doors open at 9.30am on Tuesday 30 October) is set to bring together thousands of bus and coach operators, transport planners, local authorities and stakeholders with nearly 300 exhibitors. For 2018, there is over 25,000 sqm of exhibition space – transforming the NEC’s Hall 5 into a giant showcase of the latest ‘must have’ buses, coaches, mini and midi vehicles, equipment, parts, accessories, technology, and business services. Attendees (over 9,000 are expected) will be among the first to see scores of new innovations at the show. Many of which will be defining passenger transport design, developments, and solutions for years to come. Optibus, Bus Factory, Henkel, Seeing Machines, Dräger Safety, protecfire, Multi-Mover UK, Indee Industries, VBI Minibus & Components, and Murray Uniforms are just a few of the 51 exhibiting companies making their show debut. While over in the Technology Zone – a hub of new software solutions, IT equipment, mobile technology, onboard Wi-Fi, ticketing systems, revenue collection services – Datik, ExPretio Technologies, Streamax Technology, Screen-IT Media, Travelsoft, TRL, and Zenobe Energy are also appearing for first time. New names in the miniplus Area include Stanford Coachworks and Travel by Knight. A specialist feature area for small PCV solutions, it’ll host an eclectic mix of purpose-built mini vehicles fitted with modern accessible aids, including step-free design, wheelchair lifts, seats and other safety items, alongside services for buyers with bespoke requirements. Returning exhibitors include: Cogent Passenger Seating, GM Coachwork, London Hire, Nu-Track, TBC Conversions, Eberspacher UK and Rescroft. As for vehicles, there’s a record 130 on display for 2018, including the latest marques and models from Alexander Dennis, B.A.S.E, BEULAS S.A.U, Connaught PSV, EVM Direct, Harris Auto, INDCAR, Irizar UK, MAN Bus & Coach UK, Mellor, Mercedes-Benz Buses & Coaches, NOONE Turas, Optare, Pelican Yutong, Scania (Great Britain), Temsa, UNVI, Van Hool, VDL Bus & Coach, Volvo Bus, and Wrights Group. While over in the popular Master Class Theatre, public transport leaders – including senior execs and directors from the CPT, Go-Ahead Group, Department for Transport, TfL, Transdev, Bus Users UK, and Transport Focus – will be sharing their expert insights on trends, business strategies and success. “Euro Bus Expo provides a great opportunity for collaboration and to share new and exciting developments within the industry,” says Claire Mann, director of bus operations at Transport for London. Euro Bus Expo may need little introduction to the industry it serves. Three out of five visitors to the biennial show (which alternates with Coach & Bus UK) have come before. For them, it’s a ‘must attend’ for keeping up-to-date with the latest innovations, solutions, and insights. First time visitors will soon discover the same. “Euro Bus Expo is an important event for us at NX, it gives us the opportunity to look at new solutions. I am particularly interested in advances in safety solutions and the use of technology that when deployed makes life easier for my staff and customers,” says Kevin Gale, group operations director at National Express. “We’re all looking forward to Euro Bus Expo. It’s a great way to see everything under one roof!” says Lorna Murphy, operations director at Abellio London Bus. “We always look forward to attending the show. It’s a fantastic opportunity to meet with suppliers and fellow operators whilst taking advantage of everything the industry has to offer,” says Rose Williams, director of Williams Coaches. “We always keep our diaries free for Euro Bus Expo, as it gives us the opportunity to see many of our suppliers in one place, and to learn about some of the new technologies emerging in our industry. It’s definitely worth the time!” says Ian Luckett, director at Lucketts Holdings.